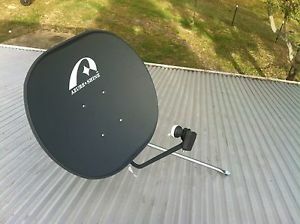 The Kansat VAST TV system gives you perfect reception of digital Australian channels via satellite. The Channels are all of the new digital channels as available in good reception areas, including One HD, ABC News 24, Seven Two, Go and GEM etc. VAST also includes local news from 7 and WIN Sunshine Coast/Bundaberg/Wide Bay and many other regions. Reception is perfect anywhere in Australia. The SatKing DVBS2-800CA High Definition PVR ready receiver and smart card is the satellite set top box which we supply and install. The SatKing can record to USB external hard disc drive or USB flash Drive. All equipment is covered by a 1 year warranty. Full System price $880 installed. More information is available on the digitalready government website.